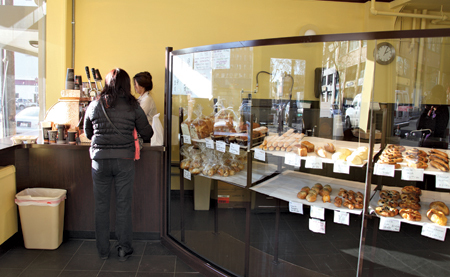 A sensational bakery opens in Seattle's International District. My colleague Lorna Yee sent me an e-mail raving about Fuji Bakery in Bellevue, but before I could cross the bridge for a treat, word hit that there was a Fuji opening in the International District. Soon after, on three compulsive visits—I couldn’t stay away!—I tasted more than my share of goodies, and there wasn’t a dud in the bunch. I discovered what may be the most delicious brioche ever ($1.25). Impossibly light and buttery, it seems to melt on the tongue. And it has cream cheese on top, which really isn’t fair. Head chef Taka Hirai worked for superstar Joël Robuchon at the chef’s Michelin three-starred restaurant in Tokyo. It shows: Every detail is attended to, and the pastries are delightful. There are absurdly good curry buns ($2.99) coated in panko breadcrumbs and fried, and sensational breads (which arrive from the Bellevue bakery around 11 a.m.). Even the petite sandwiches—such as smoked salmon and avocado with dill on a slim baguette ($2.99)—are better than they ought to be.